Bangkok is a city where some of the street food can be as good as any of the sit down restaurants and certainly much cheaper. In addition, Thai’s pride themselves on cleanliness. 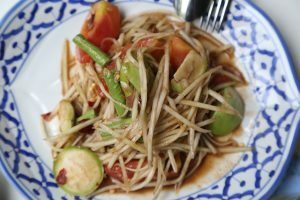 Compared to our street food experiences in other countries where we have often gotten sick, we do not get sick from street food in Bangkok. 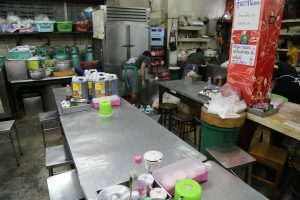 In many parts of Bangkok street food vendors are seemingly everywhere and in certain districts they stay open very late. For example if you want a soup at 1am and you are in the correct part of town – you can find this from a street vendor. 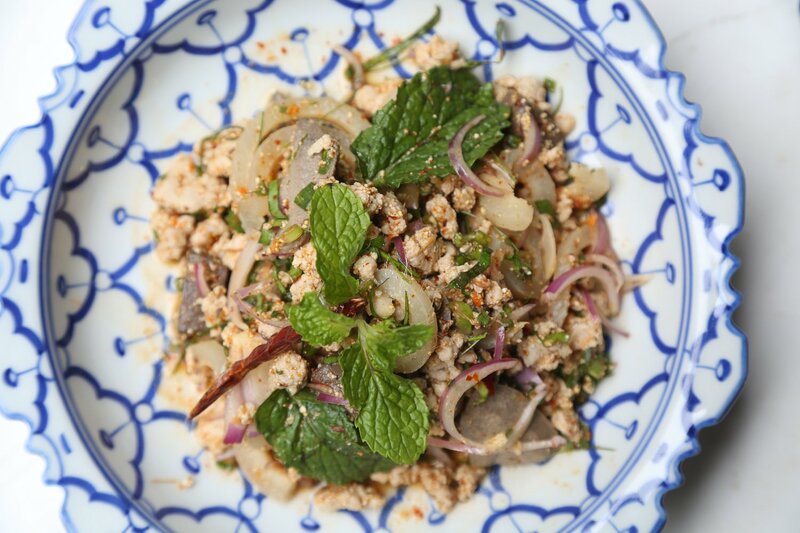 Several impressive restaurants stand out for a variety of reasons. These are highlighted below with this designation. 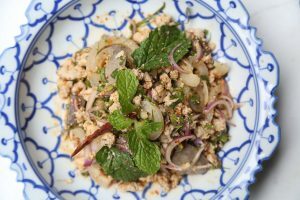 In addition to eating at numerous street vendors we have also eaten at the following Bangkok restaurants. 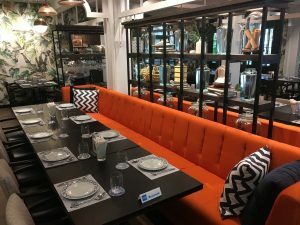 Because we are often in Bangkok we continue to add new restaurant reviews to this page over time. 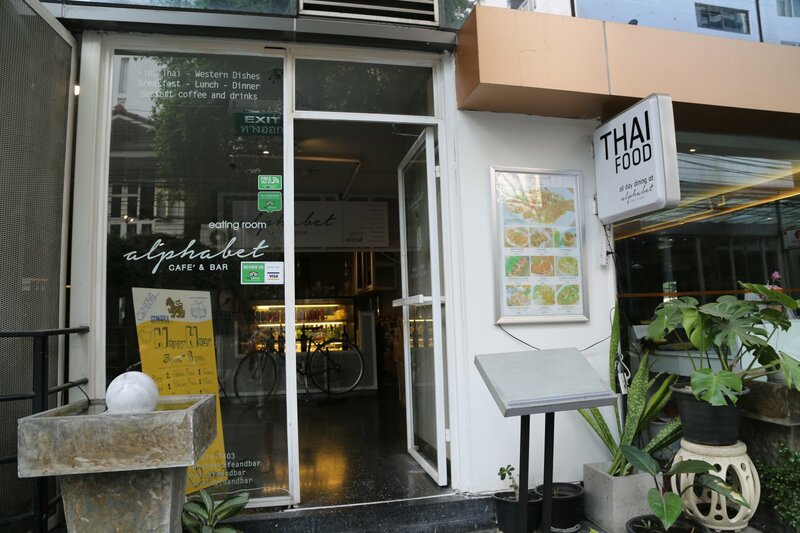 Alphabet Cafe & Bar is located within a very short walk of the Chong Nonsi Skytrain station – lucky all you do is have to make this short walk rather then pronounce the name of the street it is located on: Soi Naradhiwas Rajanagarindra 3 (near the intersection with the main road of the same name). 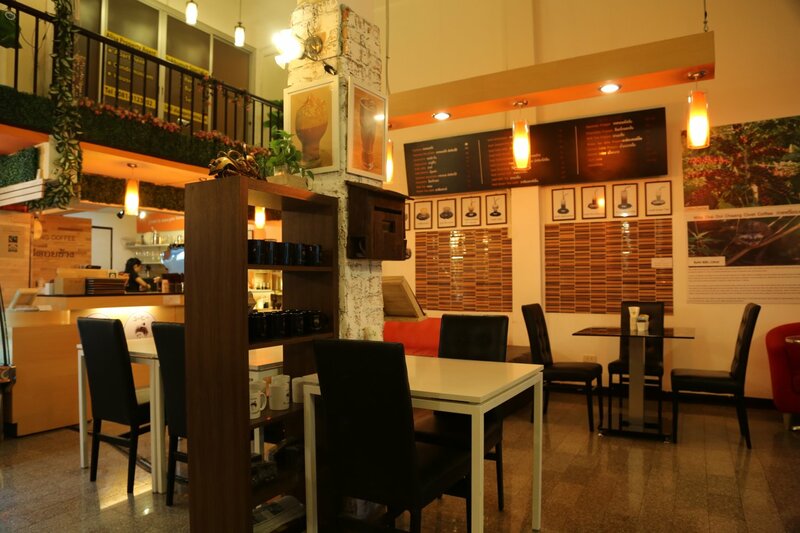 Open and airy inside this is a contemporary space for enjoying a variety of both western and Thai food. 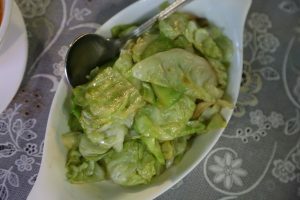 Sometimes when you want to take a break from Thai food – all you want is a Caesar Salad! 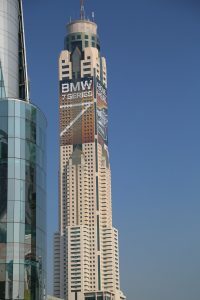 They do a nice one. 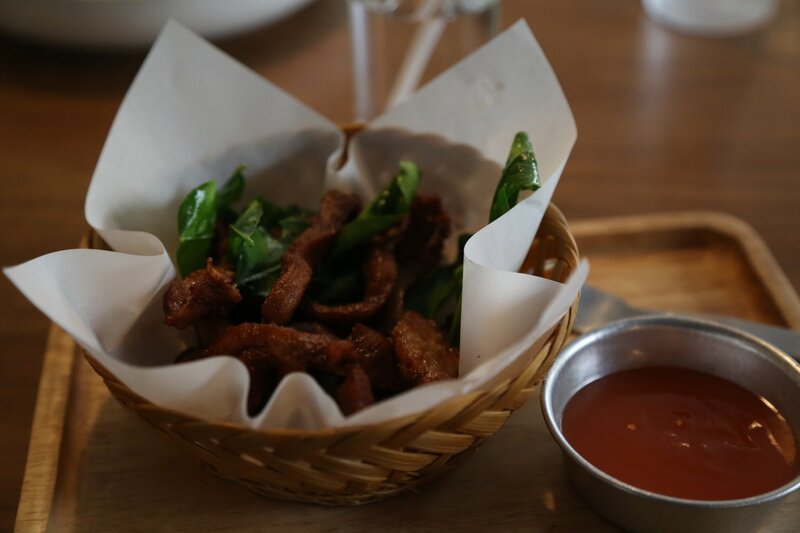 Pleasing selection of appetizers/snacks including the fried pork fingers with fried kaffir lime leaves. Good place to stop before your main event, whatever that may be. 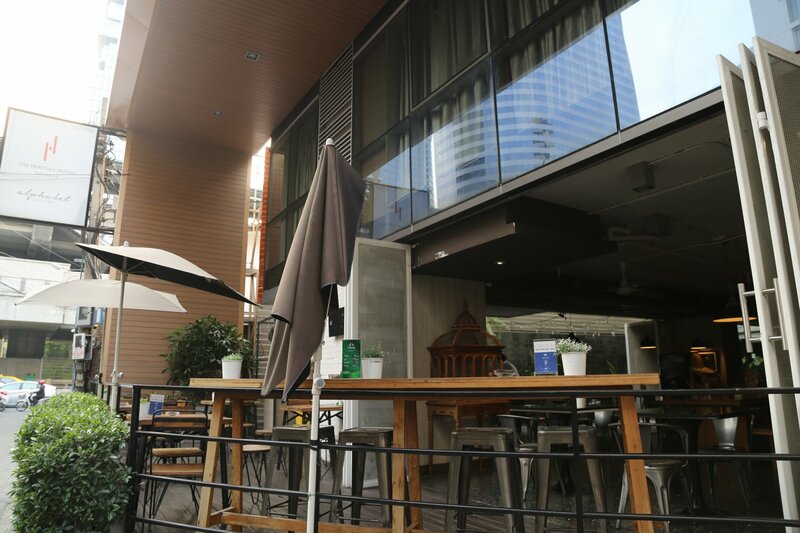 Baan Ice is located on the ground floor at the Somerset Hotel Sukhumvit 55. Both indoor dining (two stories) and outdoor dining available – outside overlooks the very busy soi. 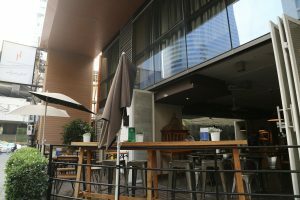 This restaurant is located within a very short walking distance of plenty of shopping and a number of high end drinking establishments. Features southern Thai cuisine – only the finest and fresh ingredients are used with their seafood delivered nightly at 3am. 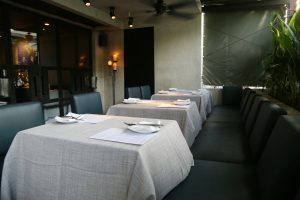 Bangkok Sky Restaurant (at Baiyoke Tower) – this restaurant is located almost at the top of Thailand’s second tallest building, the formidable Baioke I tower (only the Ritz Carlton Residences building is slightly higher). This restaurant is known for its lunch and dinner buffets. 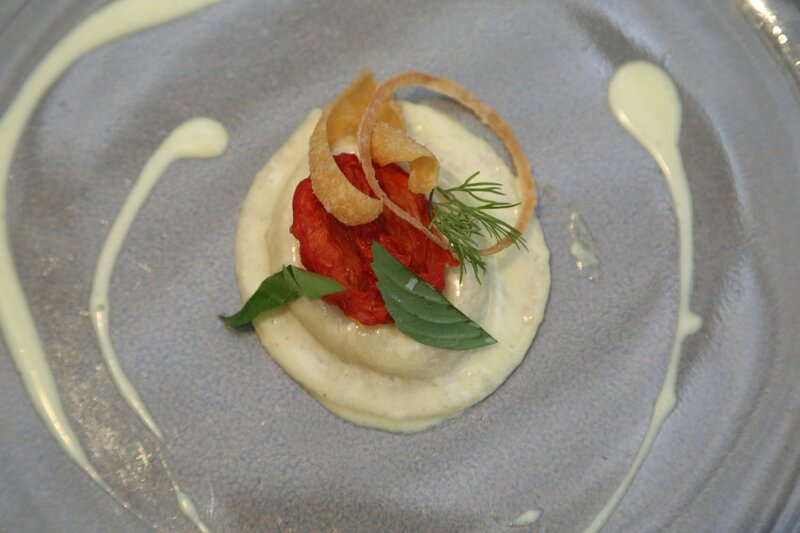 We have eaten here several times – the food is above average – but not quite top notch. 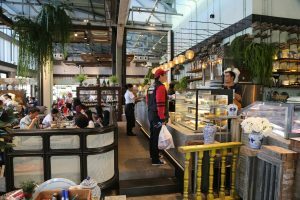 Boat Noodle Alley is tucked away among the urban chaos that surrounds Victory Monument, a little culinary oasis if you will that barely offers an escape from the incessant traffic that plagues the circle around the physical Victory Monument. 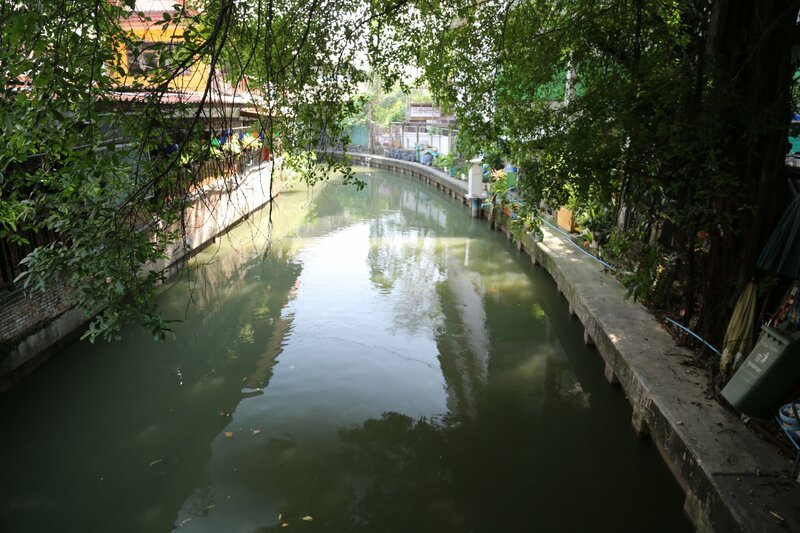 Refreshingly this alley is located along the calming influence of a small canal – although don’t expect the canal to have pristine waters – the opposite is true. Boat Noodle Alley is located a short walk north east of Victory Monument Skytrain stop (exit number 4). One can walk most of the way via the raised walkway until eventually reaching steps leading down to the roadway on your right hand side (just before the canal). Boat Noodle Alley is then accessed via a small pedestrian bridge over the canal leading off of Ratchawaithi 10 Alley. 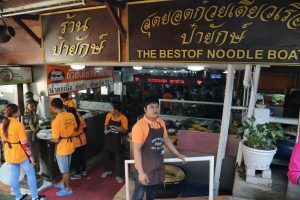 If you enter boat noodle alley from this direction – once you have crossed over the pedestrian bridge – turn right – that leads to in our opinion the best boat noodle shops (one of which is even titled “Best Boat Noodle Soup) – and we have tried numerous shops up and down the canal over the years. 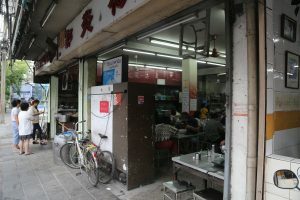 There are many noodle shops here most focusing on very small noodle dishes – with servings one can down in only a few gulps. As a result diners often order 5 to 20 of these tiny bowls. The reasonable prices reflect the small portions. It is always quite a site to see all the bowls stacked on each table once diners reach the end of their meal. The tiny soup bowls come with either pork, beef or fish balls + your choice of type of noodle and noodle size. For those who don’t speak Thai, often the waiter will bring over a plastic mold of the various noodle sizes to help facilitate communication. 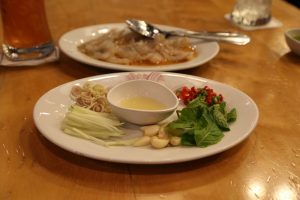 Noodle sizes and types tend to be the following: sen mee (the thinnest of the noodles), sen lek (larger sized rice noodles), sen yai (wide soft rice noodles) and baan mee (wheat noodles). 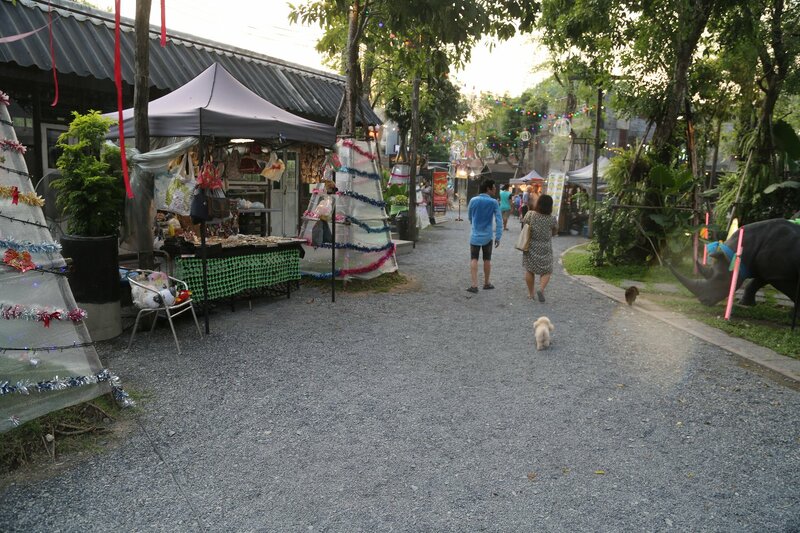 Usually not many tourists here, rather at times these shops are dominated by Thai students milling about. 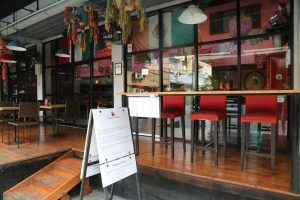 Charley Brown’s Mexicana is located at 19/9-10 Soi Sukhumvit 19 (about a 5 minute walk from the closest Skytrain, Asoke). 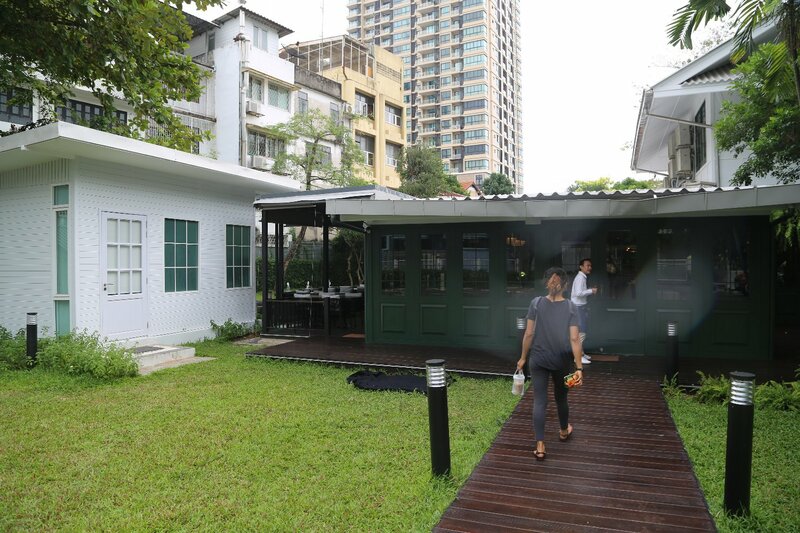 Used to be located off of Sukhumvit 11 but as is common in Bangkok – large construction projects often displace smaller long time establishments. 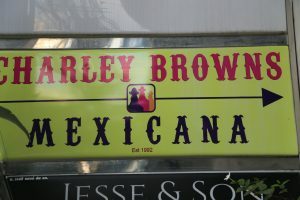 There are now a number of Mexican restaurants in town but this is supposedly the oldest. Colorful interior, often lively in the evenings – during a recent visit the chef made his rounds, moving from table to table interacting with customers. A number of customers are regulars and obviously knew the chef. Focuses on Tex Mex type dishes often with a Thai flair to the cuisine. Decent ceviche paired with Thai hot chilip peppers of course! 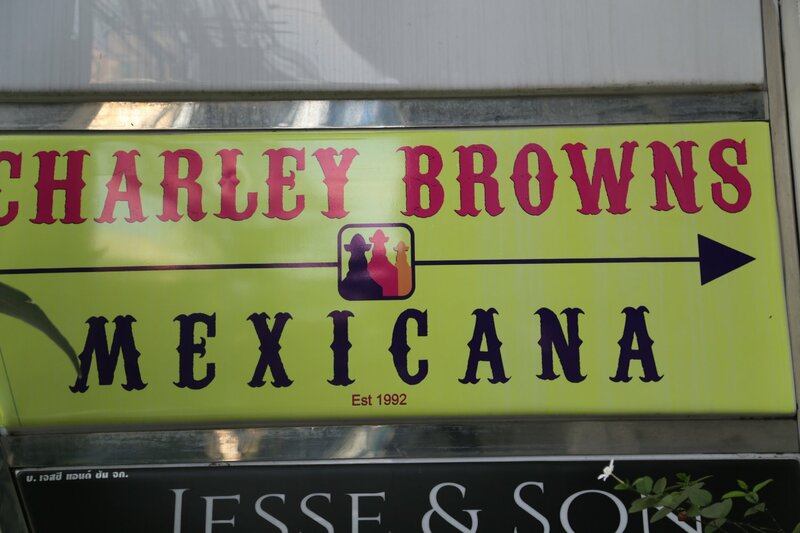 Also known for fajitas and the chicken mole. Very family friendly – even offering a children’s menu. We were here on a Tuesday which is 1/2 price for the pitchers of Margaritas. A great deal – especially if there are just two of you in which case you both might walk out of here a bit tipsy (trust us, these aren’t weak Margaritas). Chao Praya River Dinner Cruise . This is something fun to do in the evenings. 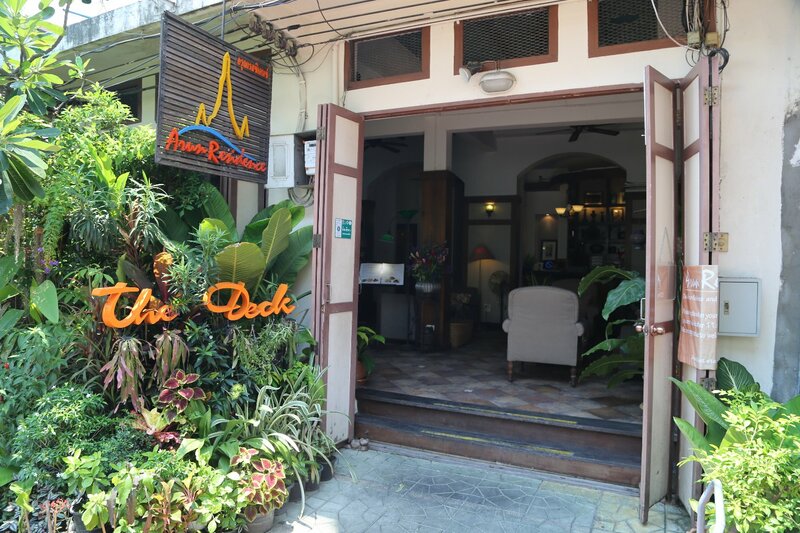 Typically the cruise will last 2 hours motoring slowly along the Chao Phraya river – dining is often on the upper deck so you can see all the lighted up temples as you pass by. 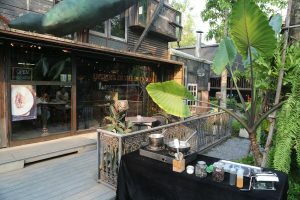 Riverside Bangkok – visit their website at website www.riversidebangkok.com (site is in Thai). 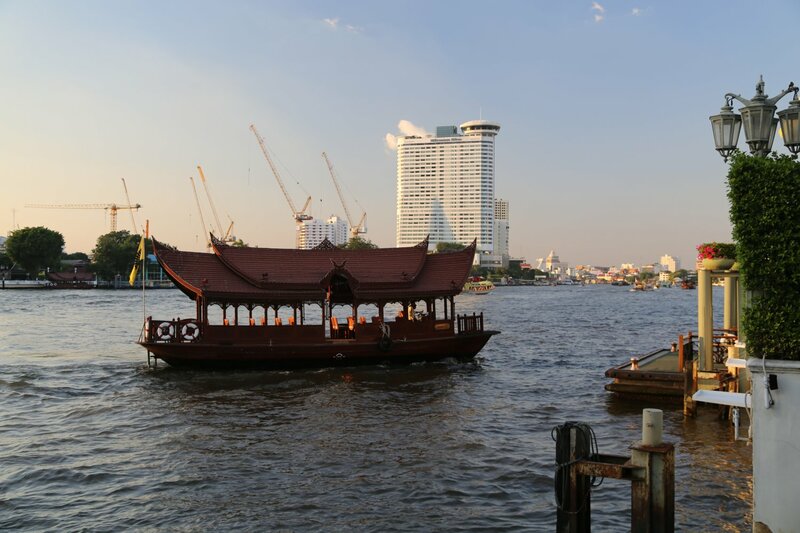 This was the first ever Bangkok river cruise we went on, and as a result perhaps the most memorable. The boat features an open air dining deck – good food especially seafood – this is a very relaxing river cruise. 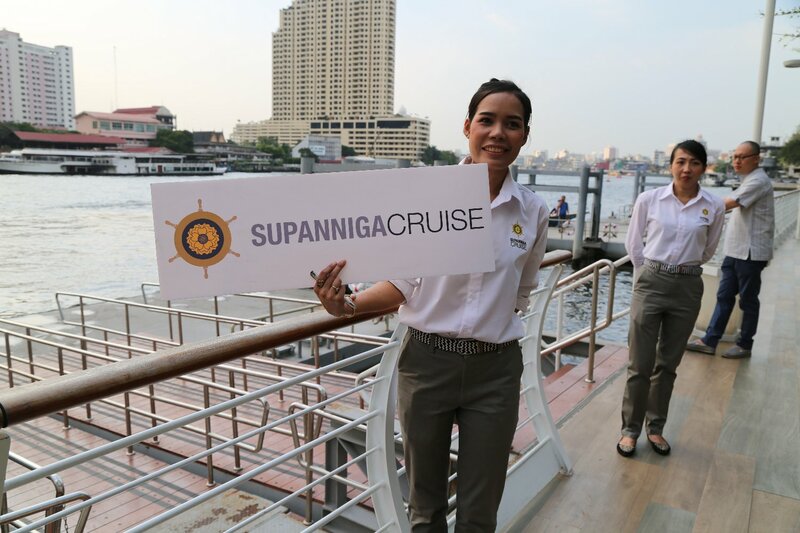 Supinigga Cruise – the story of this lifestyle brand began in Thailand in 2006 when the Laorauvirodge family opened a boutique hotel in Khon Kaen. Later they added a restaurant to this hotel. 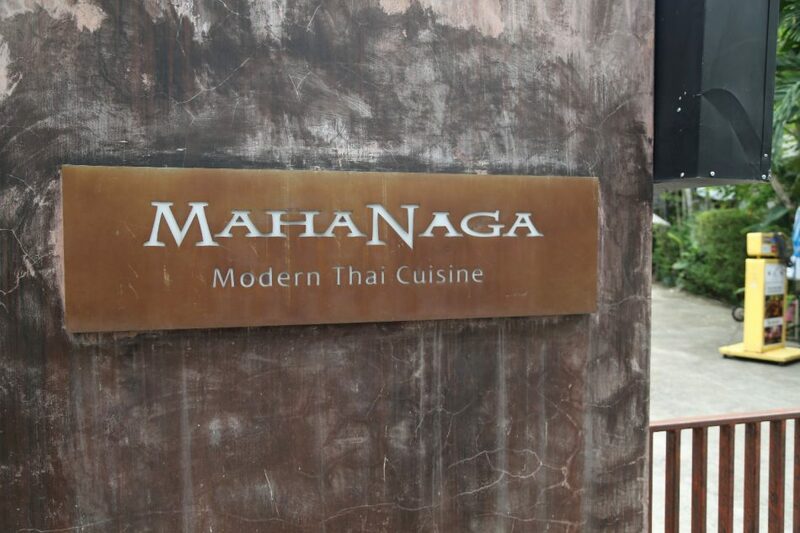 In 2013 they entered the Bangkok market with the opening of the Supanniga Eating Room in Thonglor. Both their hotel and restaurant have received numerous awards and recognition in relatively a short time. In 2016 they introduced several cruise options on the Chayo Praya River including a cocktail or champagne cruise and a dinner cruise. Their river cruises leave from the piers directly in front of the River City Shopping Center – note that numerous river cruises leave from these piers. 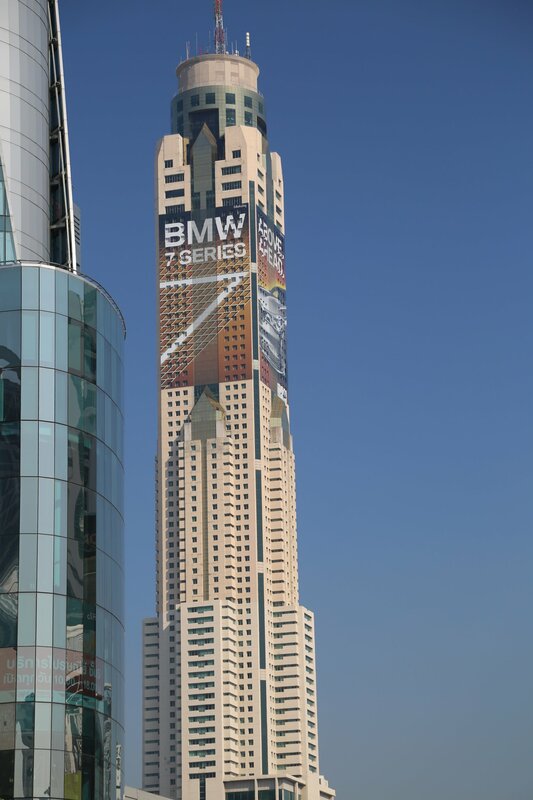 A welcoming staff greets you as you make your way to the river from the shopping center. Their river boat cruise ship contains a rare fully stocked bar. The cocktail cruise is a very relaxing way to enjoy an hour in the ‘heart’ of Bangkok passing various temples, restaurants, prominent buildings and other boats. 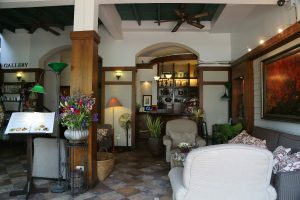 One cocktail is included along with Thai style snacks. Service is excellent while on board. An info brochure is provided which explains more about the locations of interest that you will see on your cruise including Wat Arun and the Grand Palace. Head to the top deck for best viewing and more breezes. 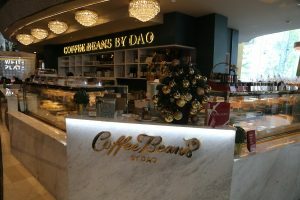 Coffee Beans by Dao – has multiple locations in Bangkok; we have visited several. 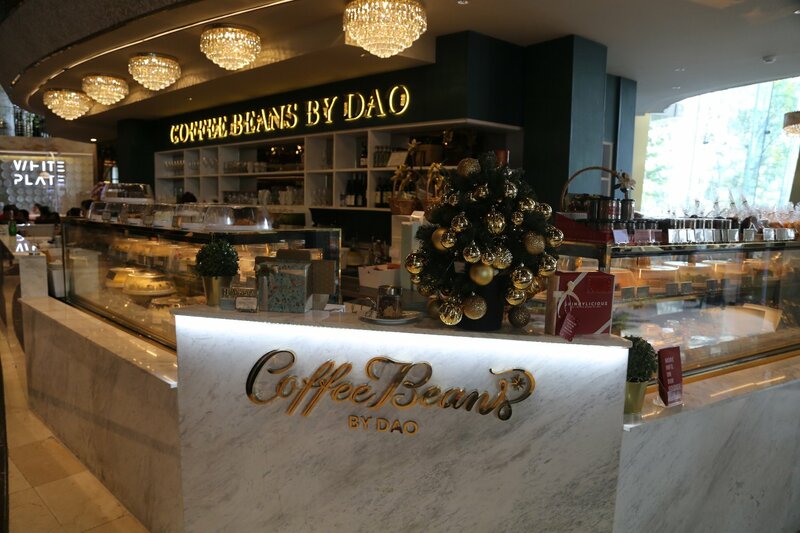 The one we initially visited is located at Ruamreuidee Village (0 2254 7117) and we later visited the one in IconSiam Shopping center. Doi Soi 12 Cafe and Restaurant is a small cafe located almost across the street from Lavana Spa and the famous Cabbages and Condoms restaurant. 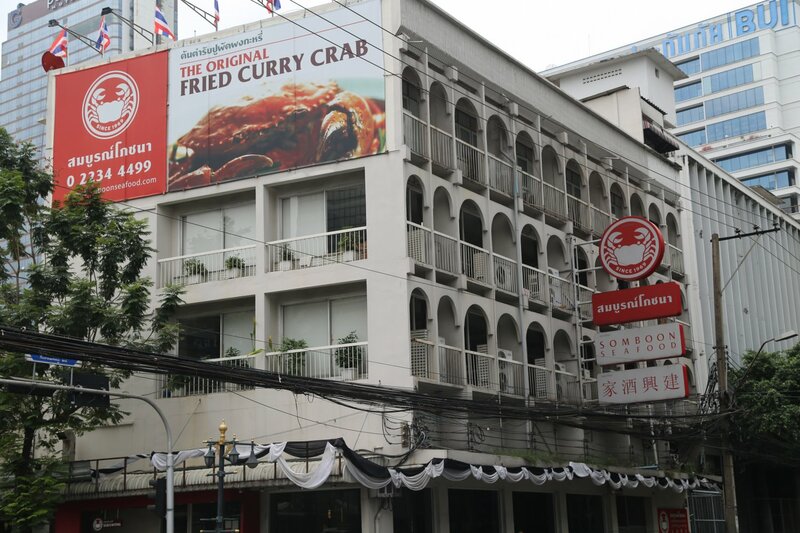 Located at 5/1-3 Soi 12, Sukhumvit Road, Klongtoey – nearest Skytrain stop within easy walking distance is Asoke. 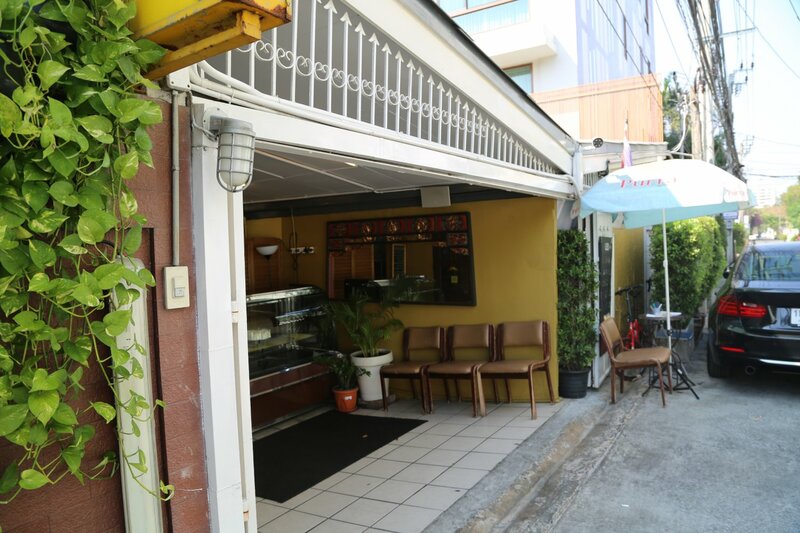 This medium sized cafe offers both indoor air conditioned seating and outdoor seating. 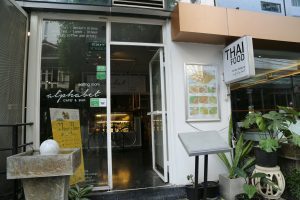 Excellent Pad Thai – also decent soups among a diversity of items on the menu. Staff has always spoken passable English. During multiple visits, they always seem to have a fruit plate on hand – often a mix of both tropical and western fruits. 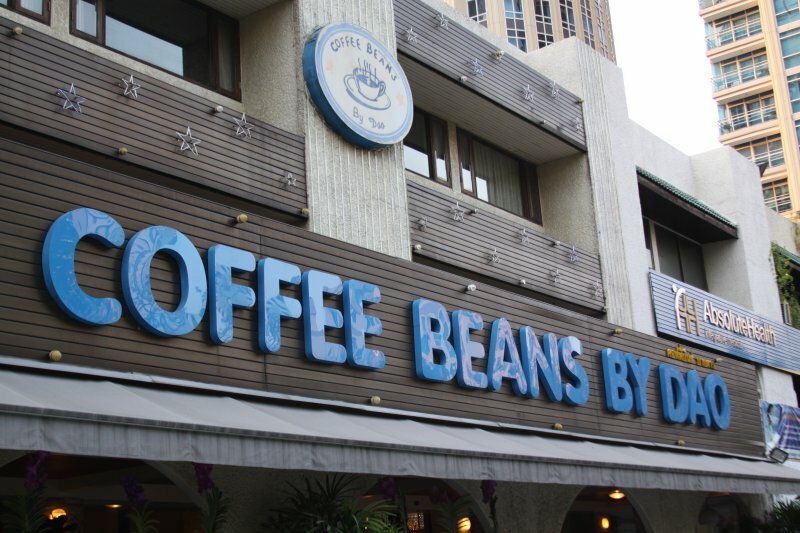 Good coffee and fruit drinks. Wifi works very well. 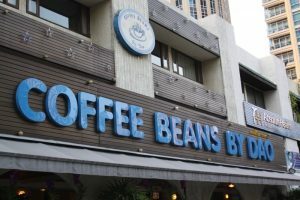 Great place to eat and get some work done while online. No bathroom in the main part of the restaurant, rather you will be given a key to the bathroom directly in the back of the building. View their Facebook Page. Eat Me is cleverly named and sounds like perhaps it would be among the cutting culinary edges of any new Bangkok dining scene – but in reality this restaurant was founded in 1998. While more then 20 years old now, it has certainly retained its staying power and remarkably kept its culinary creativity. Among the top 10 best meals we have every enjoyed – anywhere. No pretentiousness here – during a recent dinner, we spotted guests dressed in everything from suits to smart casual to wearing flip flops. Wow. It is nice to frequent a restaurant of this caliber where you don’t feel like you need to necessarily dress up but certainly have the option to do so if you are in the mood. Where to start? The bar perhaps with a cocktail. Ask to order a drink that you cannot order anywhere else and you will most likely be directed towards the “Sip some Thai” menu with a number of creatively designed cocktails several of which have a meat theme. 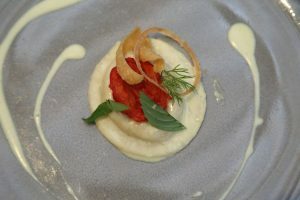 One we ordered, Laab-Moo came with a cured piece of Serrano Ham on top with part of the rim of the glass decorated in what looked to be tiny rocks which in actuality were Thai herbs and various spices. 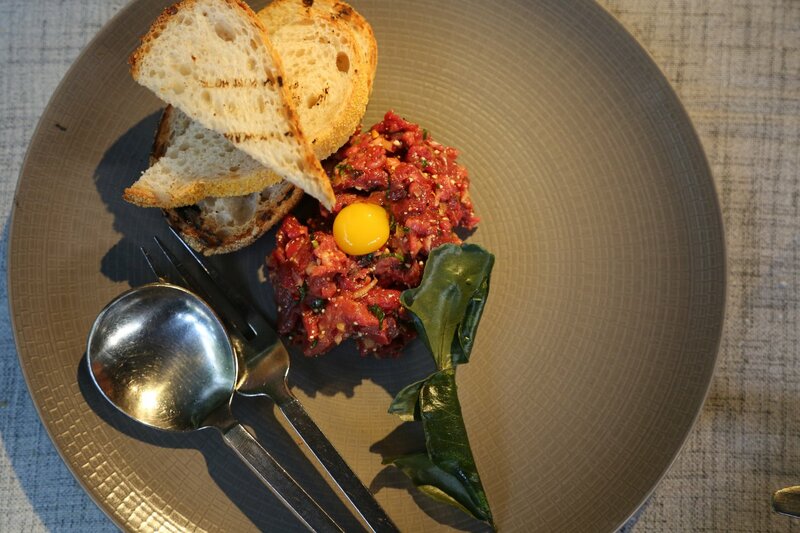 Offers an excellent selection of mostly small plates – great for sharing. The menu changes over time but a couple we highly recommend from our most recent visit are the Shima Aji Tartare, the Heirloom Tomato Salad (paired with olive oil ice cream), whole roasted lamb rack, rocket + pear + Parmesan salad and the black chicken salad. The deserts are highly desirable as well including the ever so rich and tasty sticky date pudding. 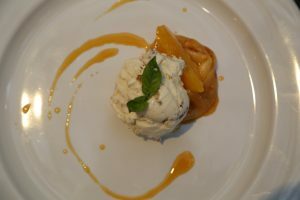 The ice creams and sorbets are home made. Has made the list of The World’s 50 Best Restaurants before (a list created from opinions and experiences of more than 1,000 international restaurant industry experts). 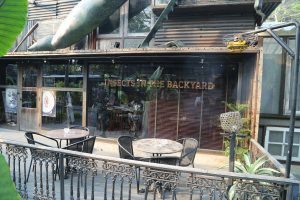 Insects in the Backyard is an extremely rare and coveted find; this is Thailand’s first insect focused gourmet restaurant. 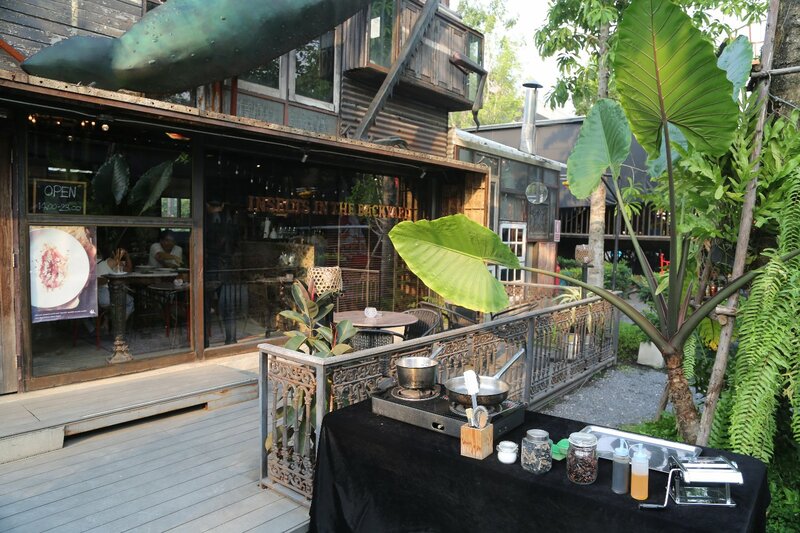 Located at Chang Chui a creative art and culinary space that Time Magazine called one of the planets 100 greatest places in 2018. Dynamic, innovative and exceptional small dishes are hand prepared by Executive Chef Mai Thitiwat. 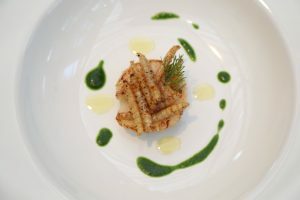 Accomplished in the culinary world he has spent time at Sirocco at the Le Bua in Bangkok and also at Mohegan Sun in Connecticut. 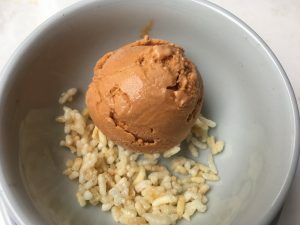 The problem most people have with eating insects (who have not grown up around this cuisine) is getting past the psychological perception that insects are dirty and carry disease. And the notion that insects don’t fit the ‘normal’ look of food. 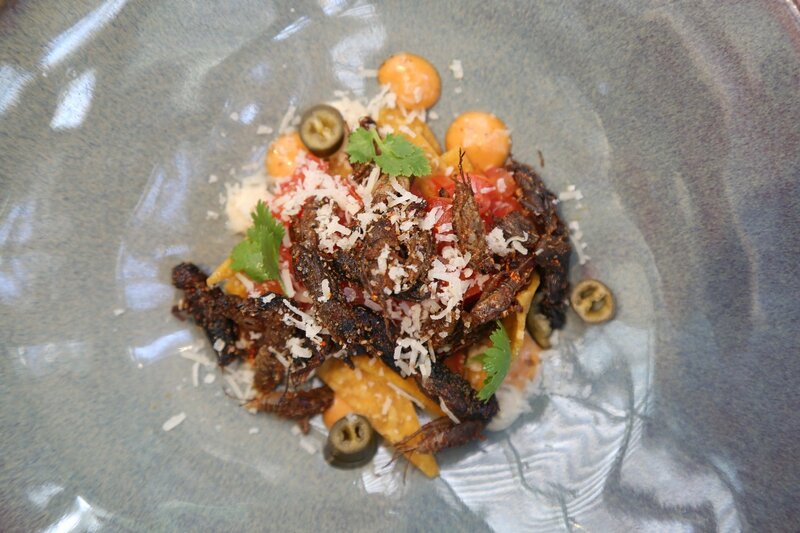 Simply ingesting a cricket or larvae can induce a gag reflex. After trying some of Chef’s dishes, one may change their outlook on eating insects – especially when they are a visual garnish rather being the main meal. 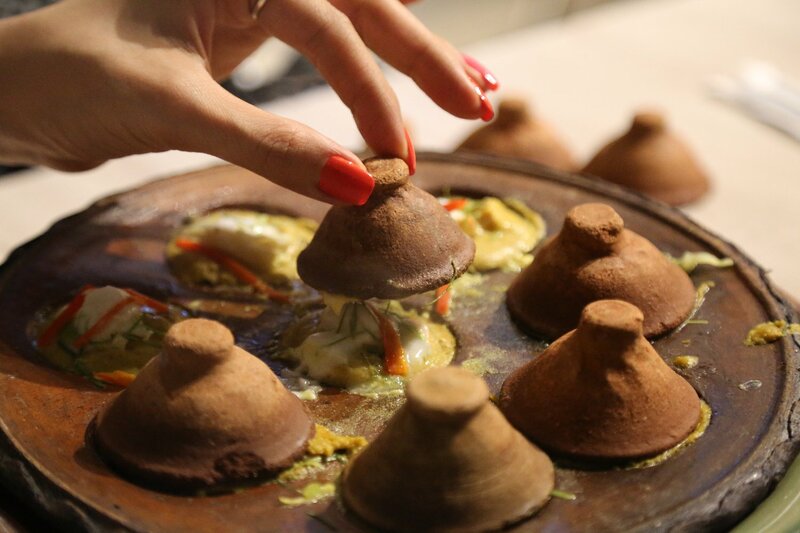 To some extent several of the dishes are very user friendly – with the insects hidden from exterior view. Presumably one who is beginning exploration of insect based cuisine should start with these. Guests can choose from a set tasting menu focusing on small insect dishes or the regular menu with more options. 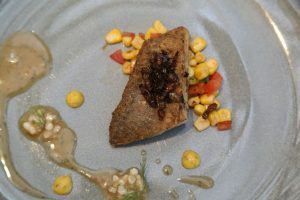 Several standouts are the Crab and giant water beetle ravioli with a turmeric saffron sauce, the Grilled seabass with ant caviar, mother of ant beurre blanc sauce and blackened corn salsa and the Wingless long-horned grasshopper risotto with fresh herb and parmesan cheese. And for desert, a must order is the Crepe suzette with silkworm ice cream. 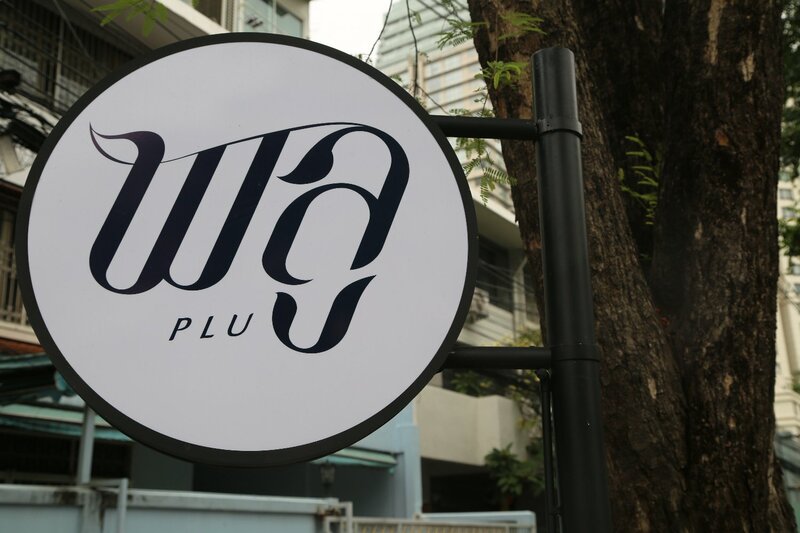 Khua Kling Pak Sod is located at Thonglor Soi 5, Sukhumvit. The restaurant is not huge, is not well advertised in front but is wildly popular during lunch time. 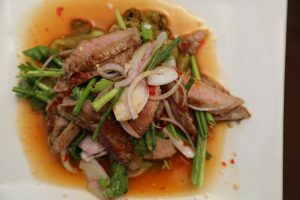 The focus here is on Southern Thai cooking (can be a bit spicy). 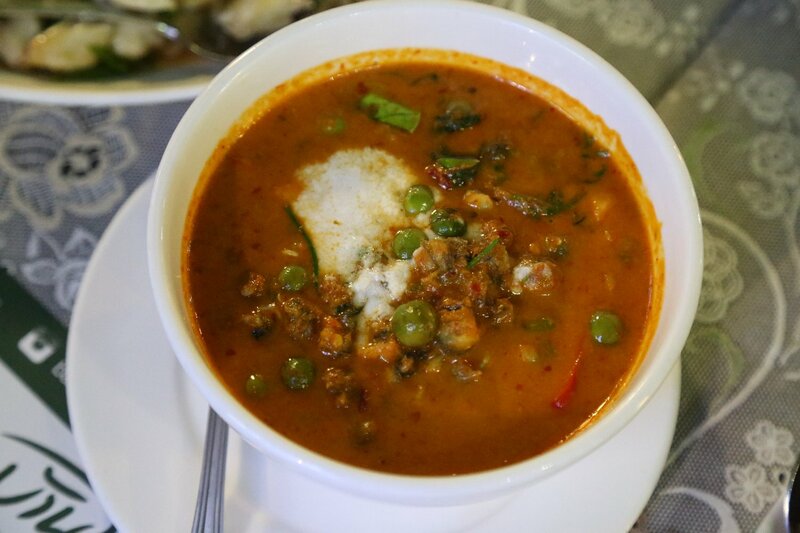 Good soups and curries. 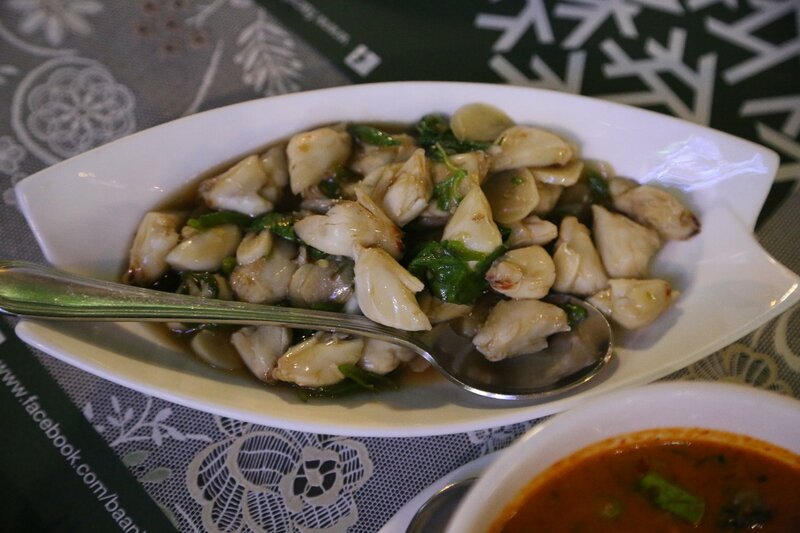 Excellent Tom Yum Platu and Neur Pu Pad Prik Kee Noo Suan. 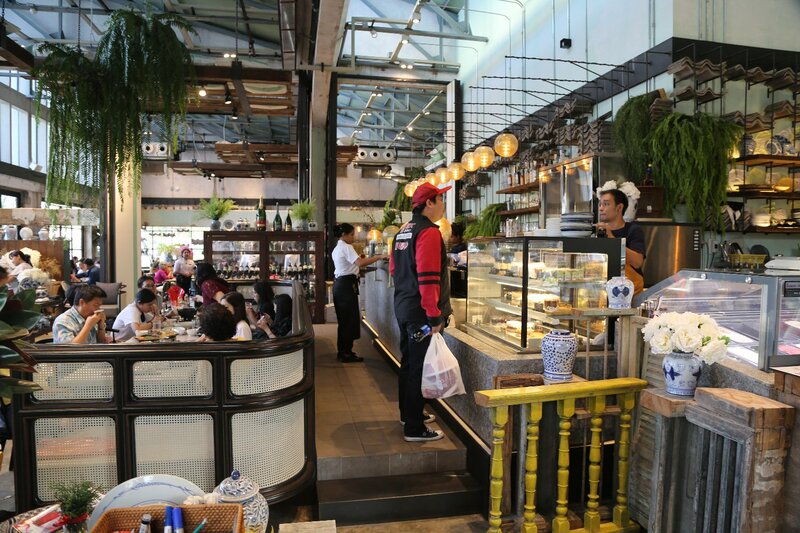 Laem-Cha Reon Seafood is located on the 3rd floor of the huge Central World Shopping Center next to the small “Asian Senses” Souvenir gallery. We keep coming back to this restaurant for the excellent seafood. This is one of their branches. Throw out any preconceived “western” notions you might have of “mall restaurants”. 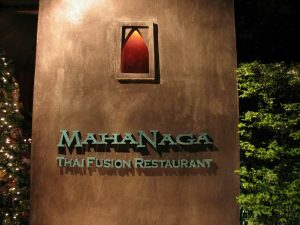 Their food is terrific, specializing in tasty reasonably priced seafood, all cooked Thai style. Some of the seating at this restaurant overlooks the Central World windowed walkway and some of the seating is actually outside of the restaurant on this windowed walkway. 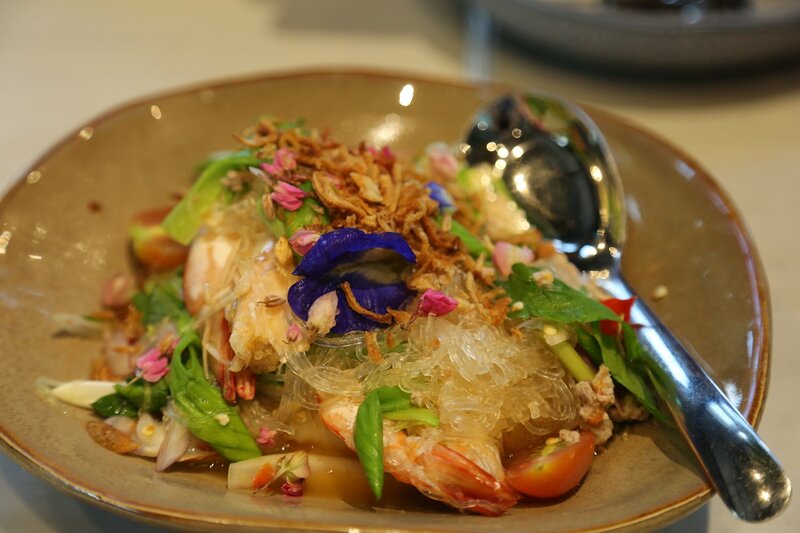 A couple of dishes we highly recommend are the raw shrimp with the fantastic lemon sauce, the Pakached (vegetable dish) – asl for lemon sauce on the side, their grilled prawns (wow! ), crab, and large whole fish simmered to perfection. Looking for a nice specific drink you cannot find that often – choose their refreshing Y2C Mangosteen juice (actually tastes like Mangosteen juice and is not that cheap mixed Mangosteen juice you often find at area supermarkets). 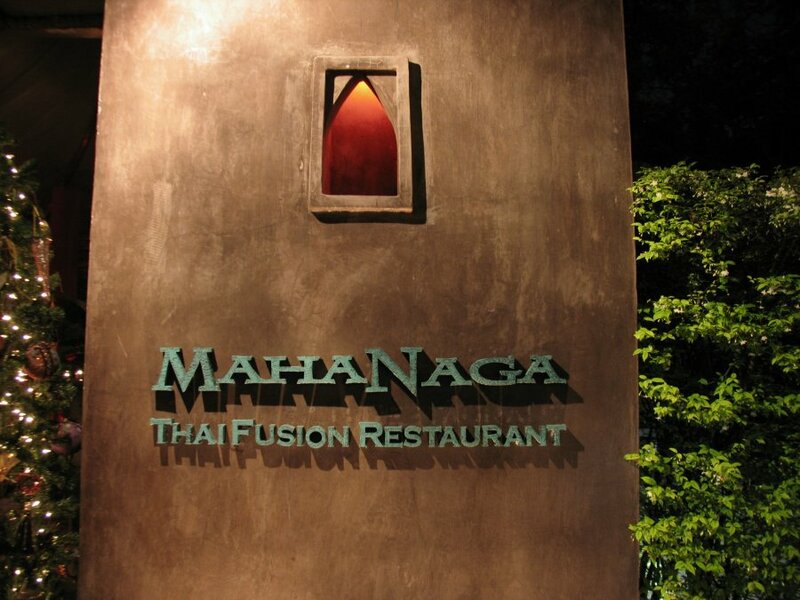 Maha Naga Fusion is located at 2 Sukhumvit 29 We originally discovered this restaurant when we were at a guesthouse in the middle of the Desert of the Empty Quarter in Oman. We saw a Television commercial promoting Thailand and the owner of this restaurant was featured in the commercial. Parking is available on the restaurant grounds. 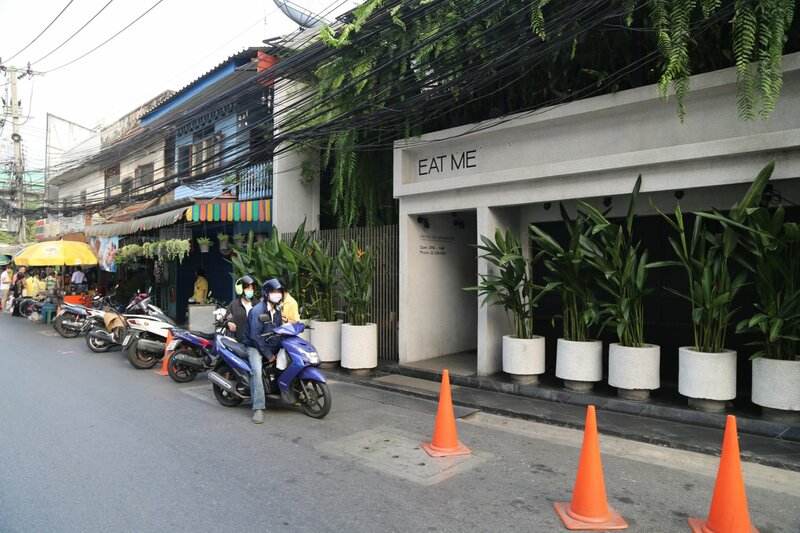 This is one of the more expensive restaurants in Bangkok. Plu Restaurant is located at No. 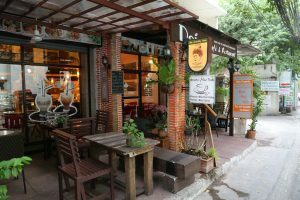 3 Soi Phra Phinit, Suan Plu Road, Thung Maha Mek, Sathorn – about a 10 minute walk from the nearest Skytrain stop, Chong Nonsi. This tiny soi feels like an oasis in the middle of the urban jungle – surrounded by tall office and residential buildings. 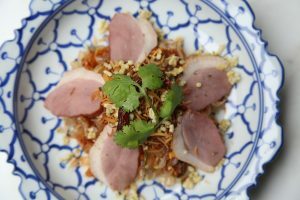 Features classic Thai food with sometimes a modern twist – especially with their cocktails and desserts. But first the food! 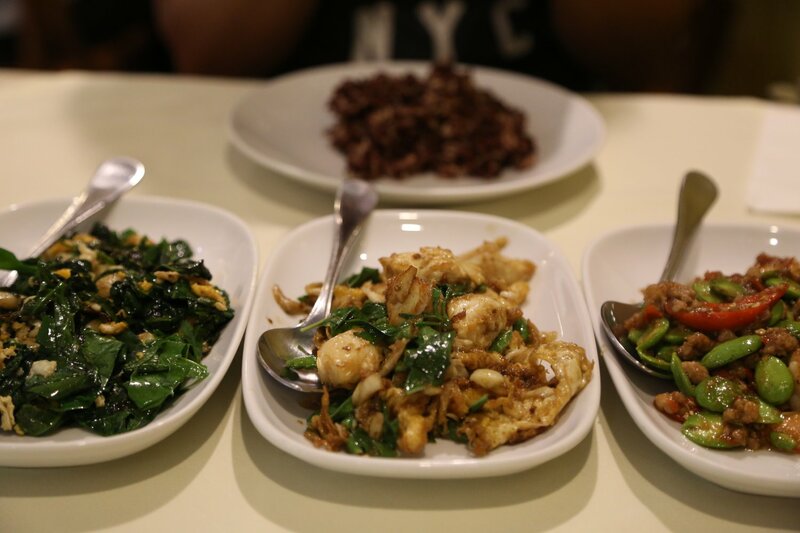 A wide selection tasty offerings including a couple of our favorites, duck with pommelo, larb gai (this dish comes very spicy so if you are sensitive to spice, ask them to dial it back a bit) and a very well made Tom Yum Goong. A lovely selection of creatively made cocktails – if you like mojitos ask for the cocktail that somewhat resembles this drink. A variety of deserts – including the always refreshing Thai ice cream, either green tea or Thai tea. 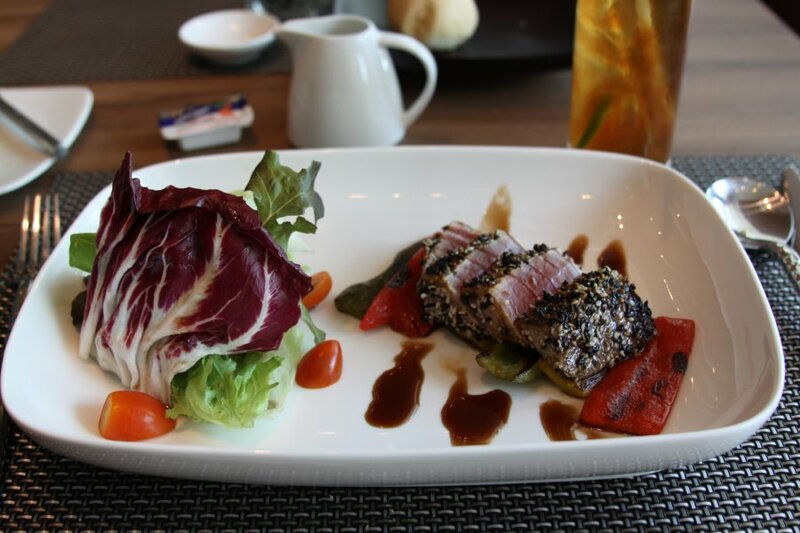 Excellent service – waiters are carefully watching throughout the meal without being intrusive. 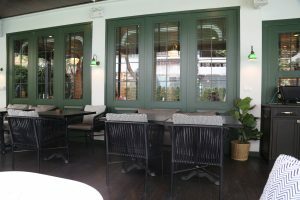 Both indoor and outdoor dining – the interior is well furnished in a colonial style. 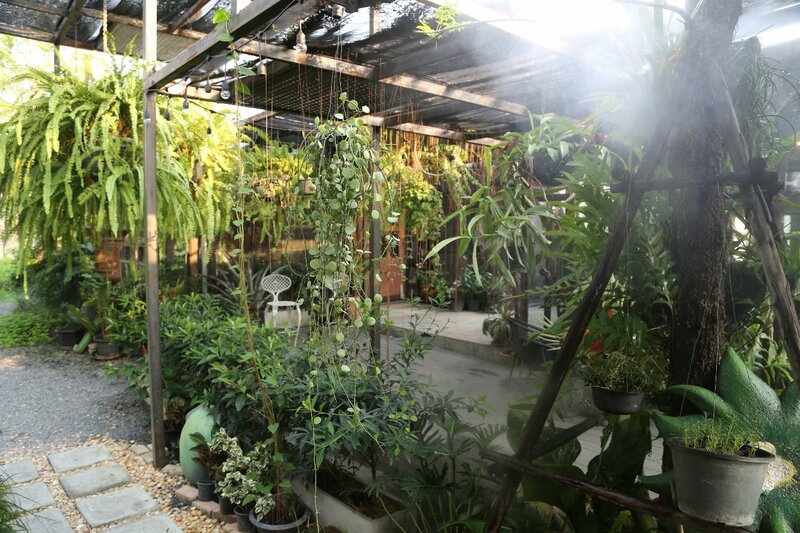 Outside is on the veranda overlooks a small grassy courtyard with tiny fountains with nearby residents sometimes using this green space as a shortcut, evidenced by a trail through the grass. Open daily from 1130am until 2pm and then from 5pm until midnight. 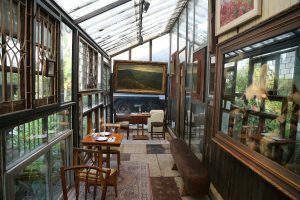 Well under the radar for tourists but is definitely worth seeking out. 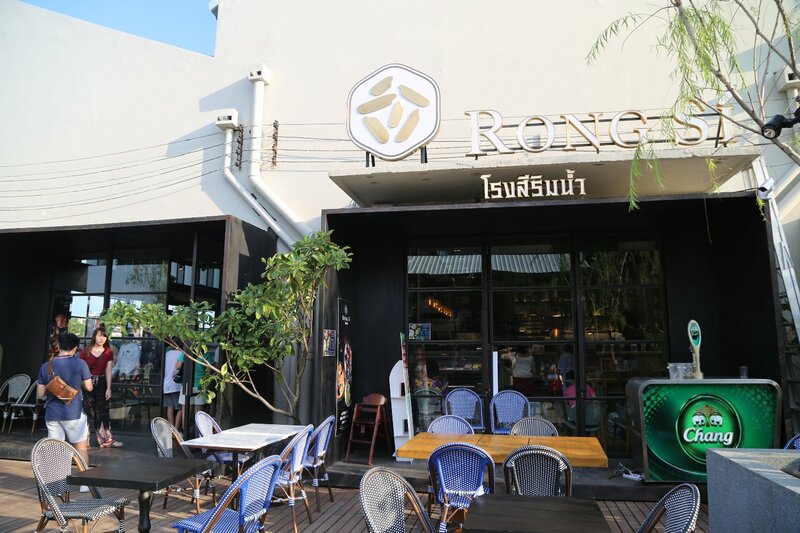 Rong Si Restaurant is located at the always popular Hlong 1919 along the banks of the Chao Praya river on the Thonburi side (on its western banks). Access is via taxi or uber or via the Saphin Taksin Pier via a boat that departs every 30 minutes offered by Hlong 1919. 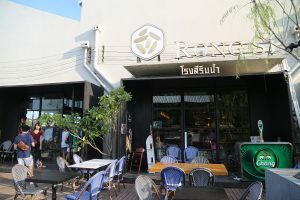 This lifestyle space opened in late 2017 – while there are a number of food options here arguably Rong Si Restaurant is the culinary highlight of a visit. 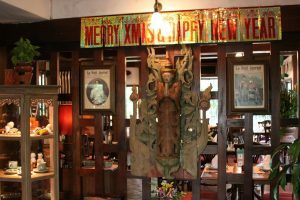 This restaurant is wildly popular at times – we have always had to put our name on a wait list for the several times that we have eaten here. 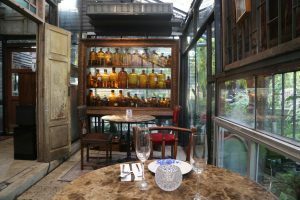 Located in an interesting space – has an old warehouse feel complete with furnishings that include tiles stacked along the sides of the wall with re-bar. 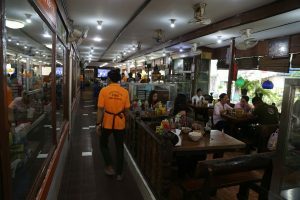 Excellent selection of drinks and delicious Thai food including various fish, spicy glass noodle salad and giant prawns. Delicious mango sticky rice. Pricey. 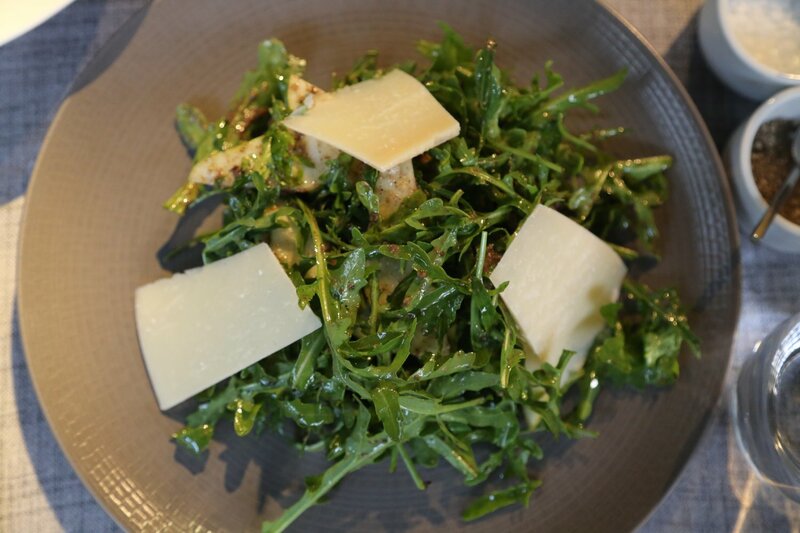 Despite always being busy during our visits, service has been remarkably excellent (for both lunch and dinner). 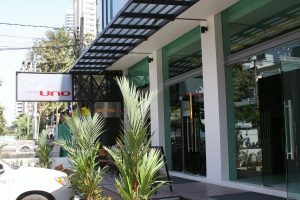 Sacha’s Restaurant, Hotel Uno maintains a delightful little cafe located right next to the main lobby in the Hotel Uno Hotel on Sukhumvit Soi 19. 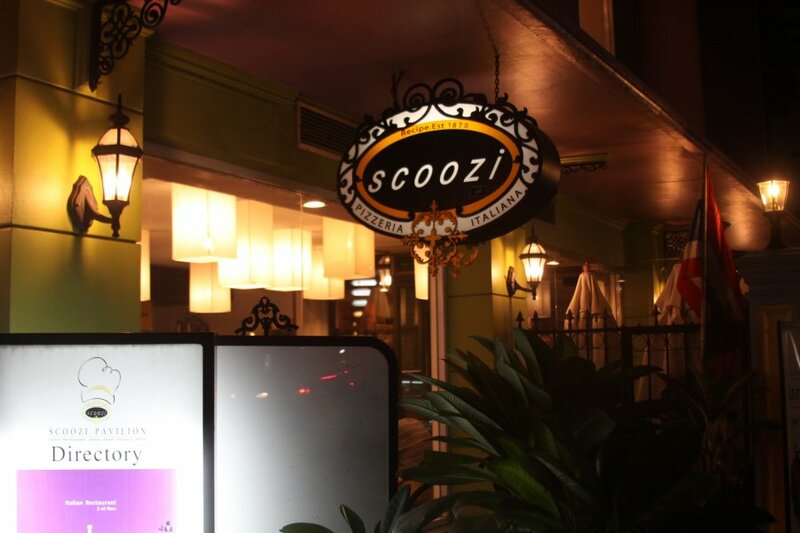 Scoozi Pizzeria has nearly 20 locations within Bangkok including the one we ate at (their flagship location in a 100+ year old house) along Suriwong Road just down from the Pat Pong district near Silom. 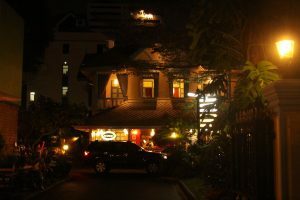 During one recent evening we saw both Italian and Thai families eating here. 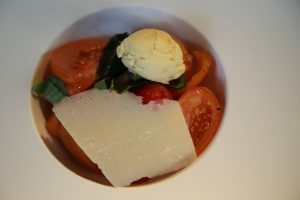 The salads are excellent especially especially the Spinach and Mediterranean. Also very nice pizzas. 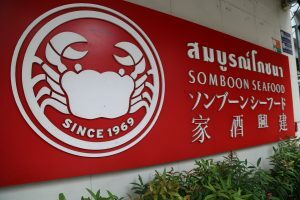 Somboon Seafood has several locations in Bangkok. We have eaten at several of their locations a number of times and keep returning! 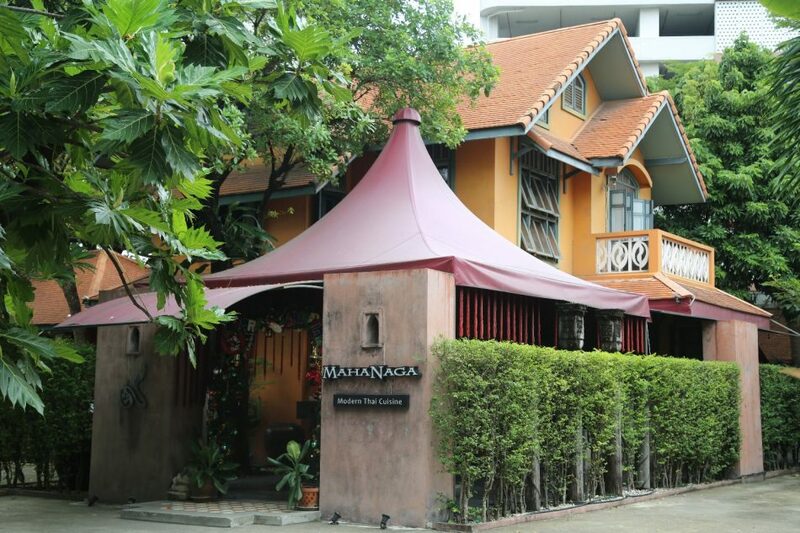 Their flagship restaurant is located at 895/6-21 Soi Chula 8 on Bantadthong Road. Their restaurants are mostly undiscovered by western tourists. Somboon largely caters to locals and Asian tourists – during busy Friday and Saturday nights we’ve seen the lines snaking out the door and each restaurant has tons of seating. Somboon was established in 1969 and specializes in Thai seafood cuisine. They also have a one page Chinese menu. 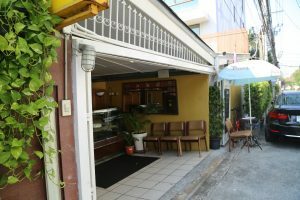 The food is amazing and is well worth the price. 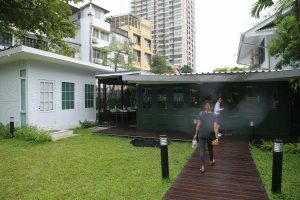 The Deck by Arun Residence is tucked away on a small soi right next to the Chao Praya River with good views looking across at Wat Arun. 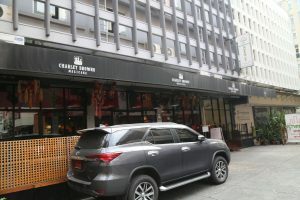 Most taxi drivers will never have heard of this place so if you can’t immediately identify its location with your driver – just tell them Wat Po (about a 5 minute walk away). Also accessbile via a 5 minute walk from the closest pier, pier number 8. 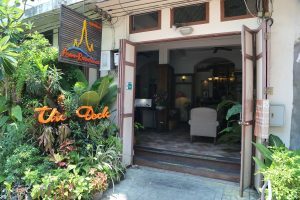 Known for its views from the appropriately named outdoor The Deck (there are several decks including the one on the first floor where we ate – and the upper most one which is reserved only for drinking). 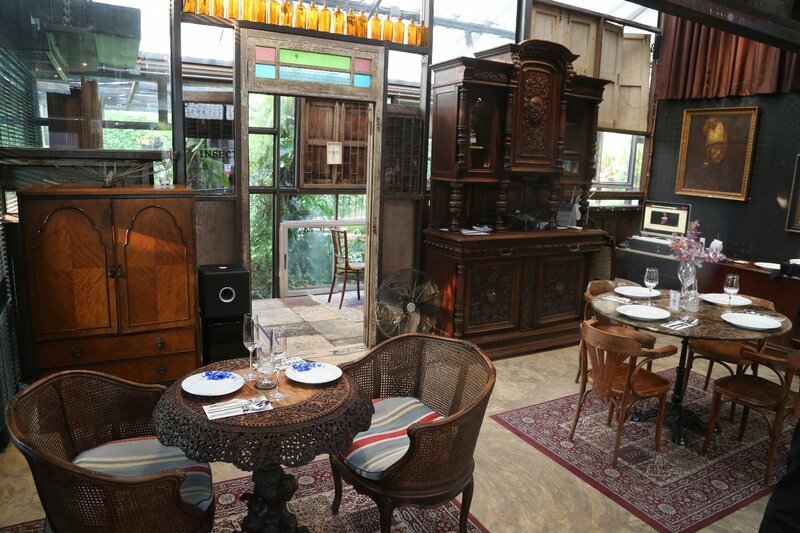 A private room is also available upstairs (availabe by appointment). 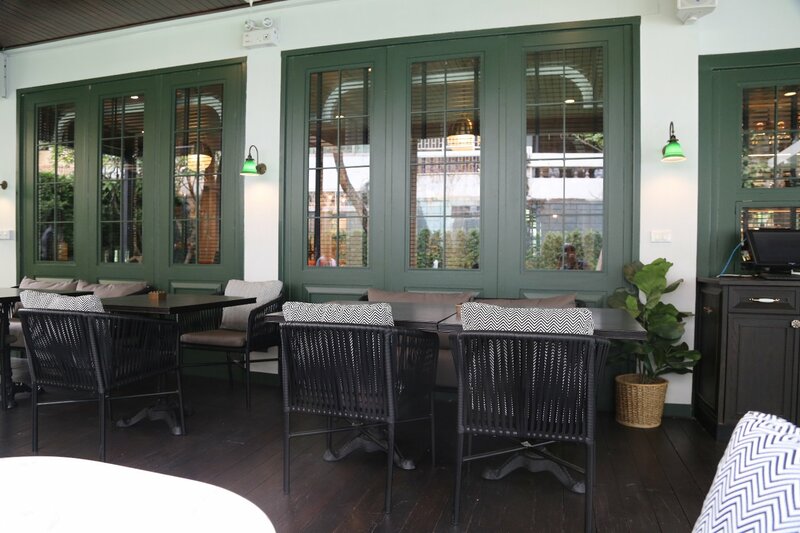 There is also indoor seating with air conditioning if Bangkok’s often stifling and oppresive heat is too much for your constitution. 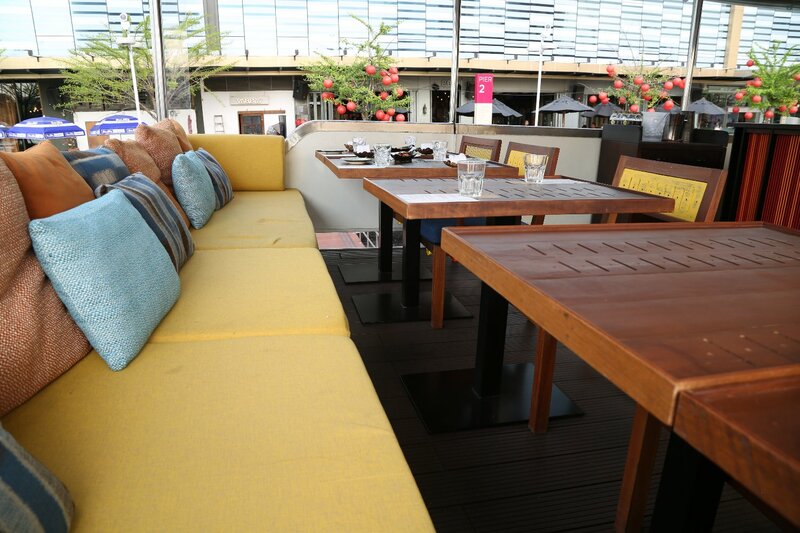 Despite being fairly busy with both The Deck and the inside seating filled up – service was surprisingly quick. Great drink selection including plenty of cocktails and several mocktails. One can throw back many non-alcoholic lemon drinks as we did during a recent visit. Very refreshing on a hot day. 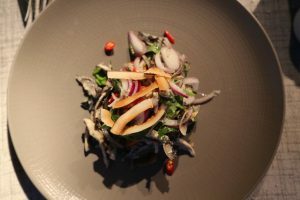 Known for its fusion style food – we found the food to be slightly above average but not outstanding. Our beef salad featured extremely tough meat. 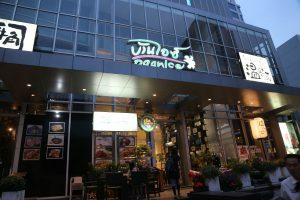 Wattana Panich is a small beef noodle soup restaurant located about a 20-25 minute walk from the Ekamai BTS Skytrain station. Founded in 1970 this is a local favorite for a variety of noodle soups. Each bowl is not huge so if you walk in sporting a healthy appetite, chances are you may have or order to bowls to become fully satiated on this deliciousness. 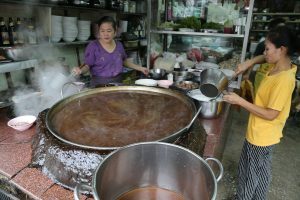 The soups come either as a wet or dry version with either thin or thick noodles. 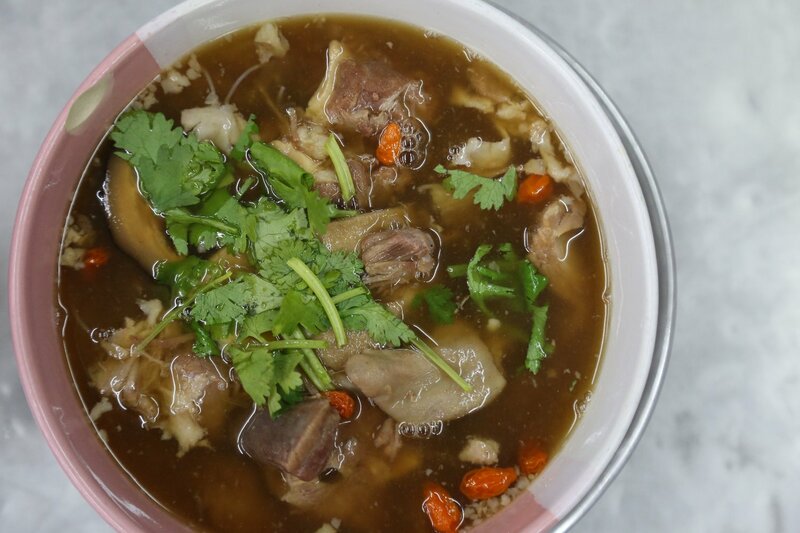 Our favorite is the goat noodle soup. 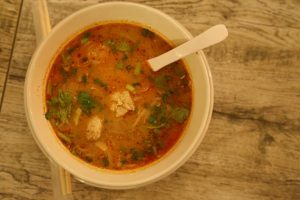 Menus are available in both Thai and English – or simply point to one of your neighboring diners if you see a soup that looks particular enticing. A giant, for better word, Calderon of hot boiling soup greets diners at the entrance. 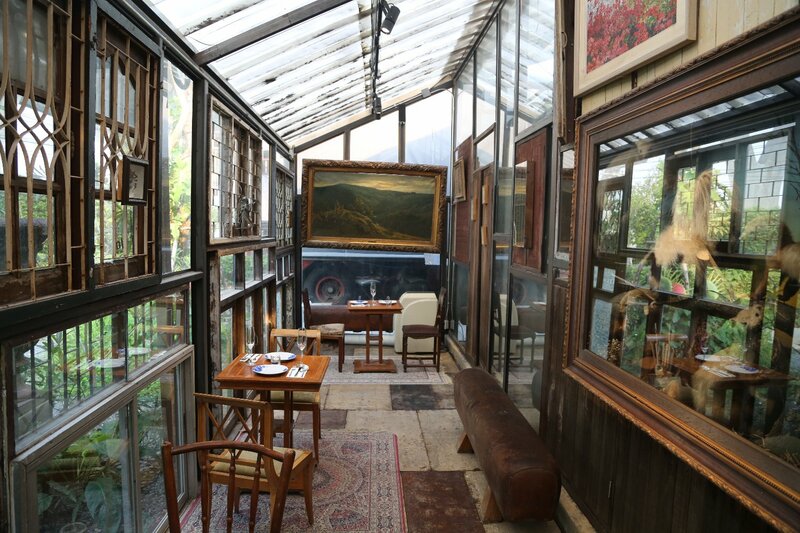 Well-worn chairs and metal tables complete a basic furnishing. One wall contains a number of articles about their soups. If you still have room, be sure to order a coconut desert served in a small plastic cup. 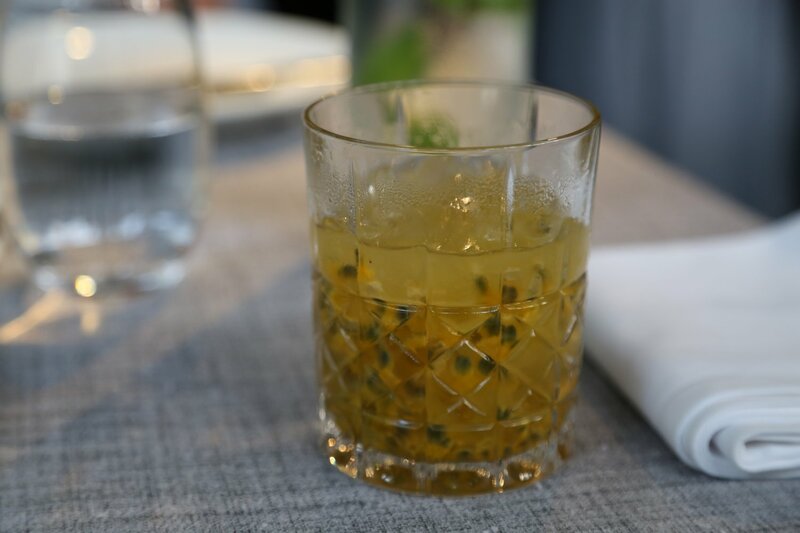 Sweet but not overly so, this is a refreshing complement to the hot soups. Open daily from 10 until 8pm, but closed on Tuesdays.